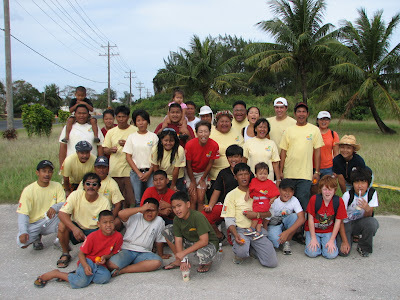 33 Volunteers participated in this month's cleanup of the road between Northern Marianas College and San Vicente Elementary School. This was our fouth consecutive second Sunday of cleaning up this road. 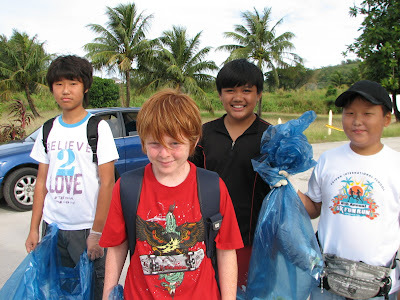 Alex, Nathan, Andy, and Harry from Saipan International School (SIS) participated in their first Beautify CNMI! cleanup on Sunday. Their teacher, Amanda Armstrong, suggested that they come to the cleanup. 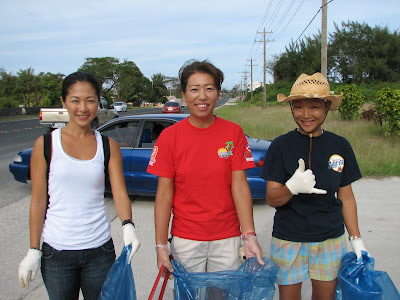 Maki Ono, Aya Matsumoto, and Mayumi Nakayama, all members of ISA CNMI, pose for a picture while picking up litter. Thank you to MINA and Marianas RC&D for coordinating the cleanup and to FMI, SIS, ISA CNMI, and Rep. Kaipat for providing volunteers. Thank you Rep. Kaipat for hauling the trash, too.